Breakout of the Boardroom and Meet in Nature! The modern day business meeting is trading in four walls for open air and natural surroundings. The Eugene, Cascades & Coast region is extraordinarily blessed to have almost 5,000 square miles of inspirational venues. Break out of the boardroom and let the open air foster creative thinking and free-flowing dialogue among colleagues. 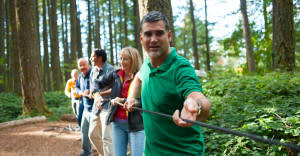 Try some positively unique alternatives like walking meetings, company retreats in the great wild and outdoor team building activities. Walking meetings are changing the way we do business; the benefits of walking meetings have been touted from the TED Talk stage to the pages of the Huffington Post. When we walk we let our guard down, promote the benefits of an active lifestyle and open our minds for more creative thinking. A 2014 study from the Stanford School of Medicine found that "walking opens up the free flow of ideas". Researchers conducted a study to gauge the effects of walking on creativity by testing people who were seated against those who were actively walking. The results showed that the walking subjects came up with more creative ideas than the seated participants. Next time you want to hold a brainstorming meeting or even a colleague meet & greet, find the perfect hiking/walking trail and explore! 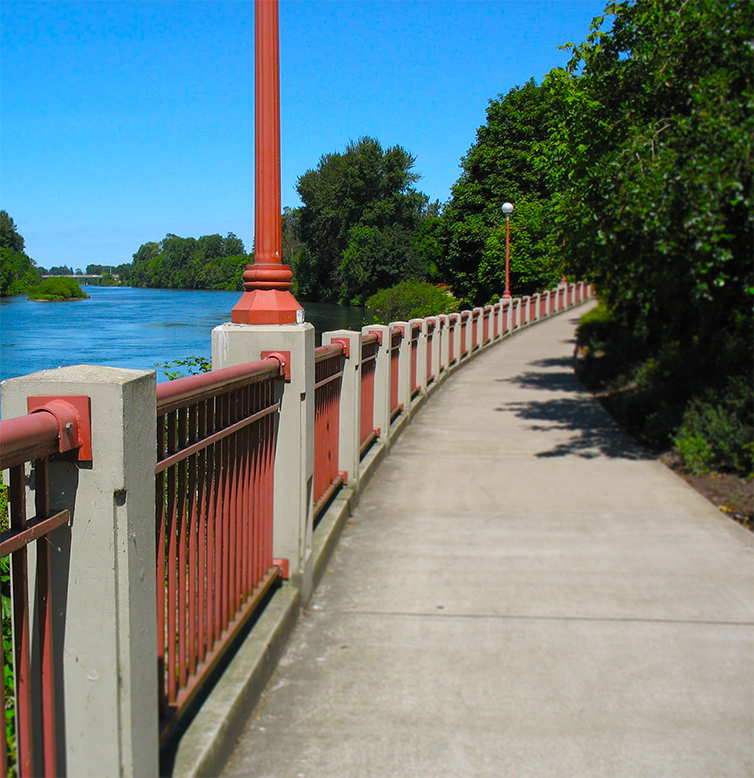 Eugene is the perfect place to expand your company’s natural horizons. 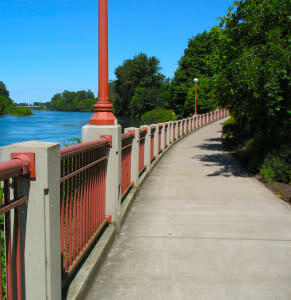 Voted one of the “walk friendliest” communities by WalkFriendly.org, Eugene boasts 42 miles of maintained paved and bark trails meandering through the city’s picturesque buttes and Rivers. The trails are easily accessible from downtown via foot, bike or car. You can even plan a longer hike through the nearby Cascade Mountains or along the Pacific Coastline. Maybe your next meeting will find you hiking the Pacific Crest Trail! William James, one of the early leaders in modern psychology, found that being in the great outdoors restores our mental functioning just like food and water restores our bodies, James defined two forms of attention: Directed Attention and Involuntary Attention. Directed Attention activates when someone is doing a tedious task like sitting at a desk and looking at the computer screen all day, and it can lead to mental fatigue. Involuntary Attention, on the other hand, activates when someone is doing something they are excited about and engaged in, and it doesn’t cause the same mental exhaustion. Being out in nature helps stimulate Involuntary Attention, promoting fresh thinking and mental alertness. According to the research of University of Michigan psychology professor Stephen Kaplan, being in nature is an integral part to restoring and resetting our minds and combating mental fatigue. Kaplan concludes that, "Natural settings are often the preferred destinations for extended restorative opportunities. The seaside, the mountains, lakes, streams, forests, and meadows are all idyllic places..."
Nature helps rejuvenate and restore mental functioning on an individual level and it can do the same for your workforce. Plan an outdoor company retreat or even a picnic luncheon at a park to get the creative juices flowing and inspire your team! 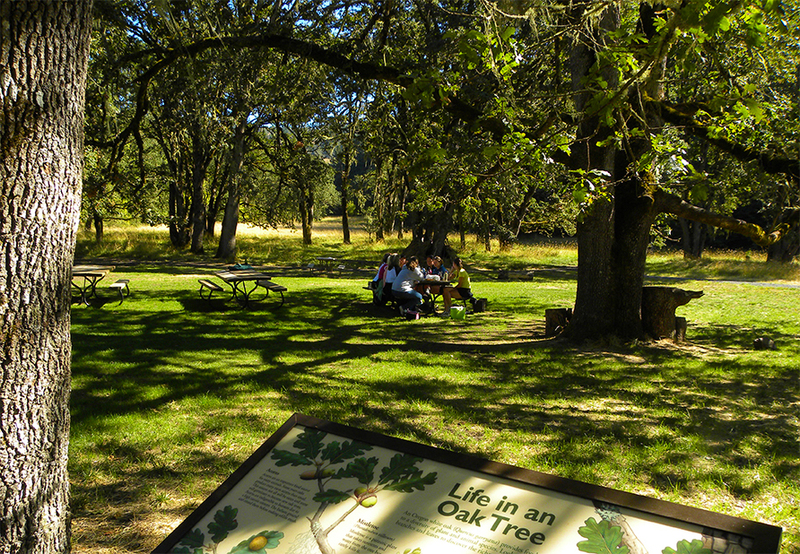 The options for natural meeting spaces in Lane County are nearly endless. 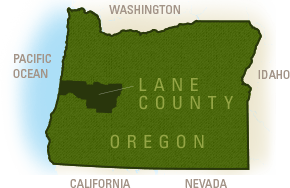 Lane County is home to miles of old growth forests, refreshing lakes and reservoirs, rushing rivers, cascading waterfalls, hot springs, spectacular mountain vistas and the breathtaking Oregon coastline; so many perfect locations for your next company gathering. 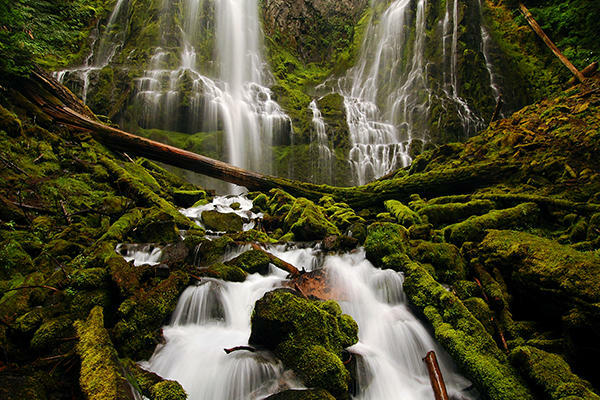 Lane County has a bounty of natural options to offer. 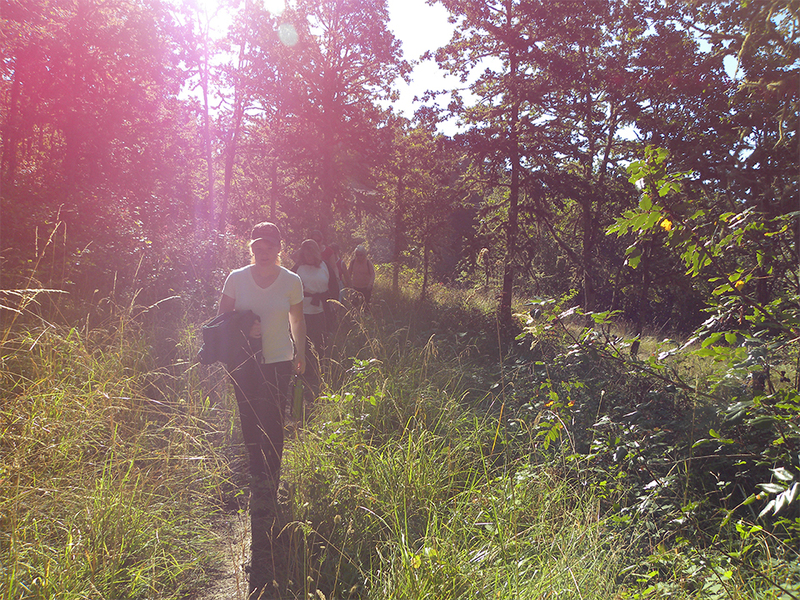 Plan a picnic at the Mount Pisgah Arboretum, just minutes from downtown Eugene, and watch as the array of wildflowers, plants and trees work their restorative magic on your team. Assemble for a company dinner along the banks of the rushing Willamette River that runs through the heart of town. 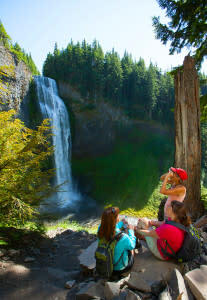 Arrange for an afternoon of hiking in the Cascade Mountains alongside wondrous waterfalls, canoeing over a petrified forest and taking a relaxing soak in the volcanic waters of a majestic hot spring. Your organization will return united and refreshed, and ready to take the next steps together. Corporate success can be narrowed down to the ability of individuals to build effective teams. According to The Team Building Directory, an online resource for anyone who is interested in corporate team building, taking employees out of the office environment helps break down personal barriers, eliminates distractions, and allows individuals to have fun. Florence, Oregon is home to the first sand board park in the world, Sand Master Park. They offer sand board lessons, dune buggy tours, helicopter tours, sand sculpting and a garden picnic area. 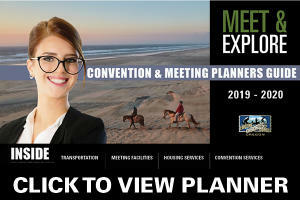 Just one hour west of Eugene, the Oregon Dunes National Recreation Area offers unique ways to connect with your employees. 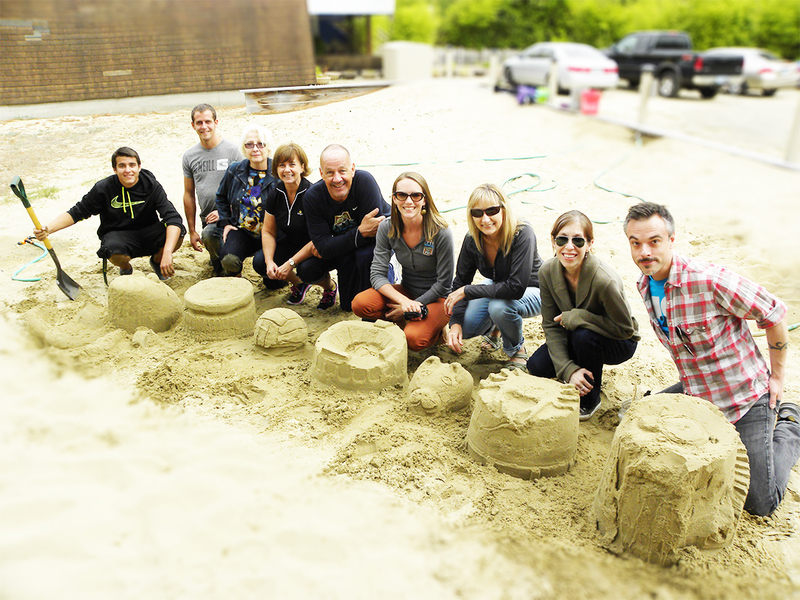 Build a full size sand sculpture together or take a guided sand buggy tour. 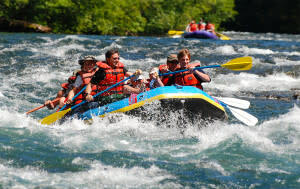 Get the adrenaline flowing by planning a white water rafting trip. Give everyone a paddle and work together shooting the rapids of one of Oregon&apos;s mightiest water ways, the famous McKenzie River. One international group that Eugene recently hosted, held their annual conference at the Hilton Eugene and worked with a local river outfitter to book a white water trip for 44 rafters. River guide and white water adventurer owner Jonnie Helfrich, of A. Helfrich Outfitters, tells us, “We love having the opportunity to share this unique experience with folks here visiting our area. We do everything we possibly can to make the process of arranging the trip as easy on the organizer as possible. 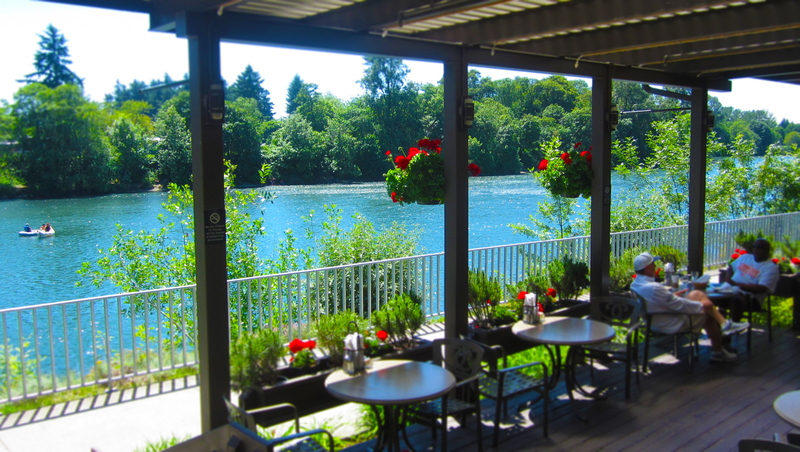 The result is a few hours away from the meetings and the city to the crystal clear waters of the McKenzie River to relax and refresh and, of course, to get wet!”. 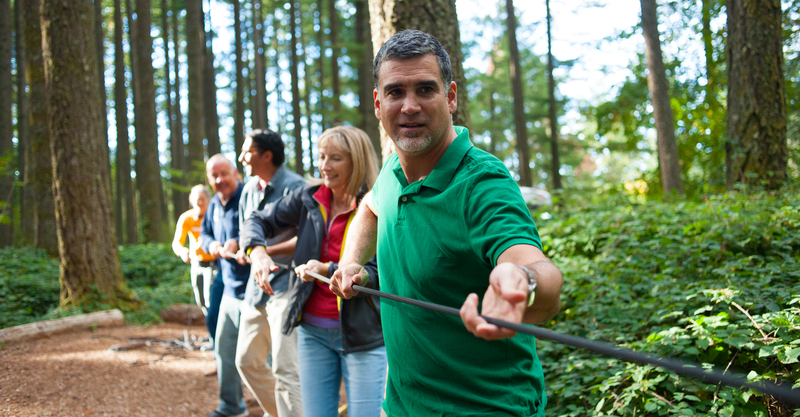 There’s no need to travel far away from the city when looking for the right outdoor team building activity. Occupying the south side of Eugene is Spencer Butte. Beyond being a beautiful location to go hiking and taking in the panoramic view of the Willamette Valley it’s also home to the Spencer Butte Challenge Course. This is a challenge course designed to empower individuals to learn, grow, and explore through activities on the ground and in the air in a beautiful natural outdoor setting. Many elements are accessible and adaptable for people with disabilities, and all activities can be adjusted to varying degrees of physical or mental challenge. What are you waiting for? Get outside and connect with your team! You’ll come back a more unified and stronger organization. Talk to a member of our Convention Department today!